The brief was to remodel a small 2-storey cottage into a comfortable home for holidays and weekends, to be shared between two families. Windows to the kitchen and lounge at the rear were replaced with large glazed doors to visually open up these spaces and to enable breaking out into the adjacent conservatory space when there are many people in the house. 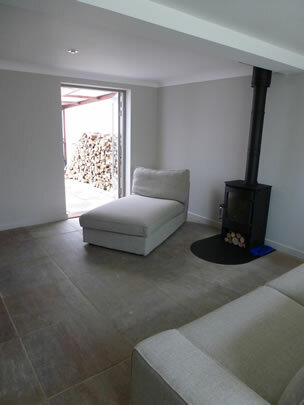 The kitchen was remodelled to accommodate family dining and a separate utility area; a steel multi-fuel woodburning stove was installed to heat the house up quickly when arriving on cold Friday evenings.